What's the packaging equipment tax deduction for 2018? To take advantage of these major cost savings, equipment needs to be purchased or financed AND put into service during 2018. It began on January 1st and ends on December 31st. The maximum amount that a company can spend on equipment to qualify is $2,500,000. Packaging equipment is a large investment that can be justified with Positive ROI and these tax savings. Bonus depreciation is also now 100% for 2018. This happens after the spending cap is reached on equipment purchases. This is great if your company ends up spending more money than the spending cap. Say a company spend $400,000 on equipment during the 2018 year. Using the Section 179 equipment tax deduction, they'd qualify to take off the entire amount of their purchases. It's under the 1 million dollar threshold and they purchased and installed it in 2018. Let's also assume they fall into a 35% bracket tax rate. They're purchases on packaging equipment will only cost them $260,000 this year. That's a savings over $140,000. 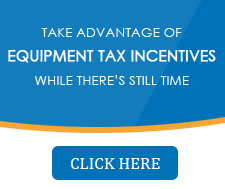 The equipment tax deduction changes every year, so put it to good use today by investing in automatic packaging equipment. Using a manual packing process is hurting your bottom line and automatic packaging equipment is the missing key to success. Efficient product flow in your packaging process is a huge key to your success. What happens when there's human errors, inconsistent quality, damage from shipping, and increasing labor costs? Your process slows down and it costs you more money. These problems can be fixed with automatic packaging equipment, whether they're semi-automatic, fully automatic, or full integrated systems. Here's just some of the benefits to using equipment in your packaging process. Bundler strapping machines and the larger strapping machines are made with any production process in mind. These end of the line machines can match your production speed to reduce bottlenecks. Strapping equipment varies from semi-automatic, arch, fully automatic tabletop, and conveyor. Installing these machines reduces the amount of manual labor needed because it'll take less people to strap a package or load than before. These packaging systems get consistent strap placement and load integrity for high production applications. Some of these applications include; bundling, baling, carton closing, and of course unitizing. 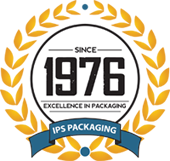 Does your packaging process output 10,000 bags in a single month? If so, an investment in bagging machines can be justified. The technology used in these machines help reduce labor costs, distribute even weights, and help prevent damage during shipping. What can bagger machines do for you? They're able to reduce labor by up to 80%. With rising costs in labor each year, that's a major cost savings. We've all heard how much shipping damage can cost you. Stretch wrapping equipment can recover up to 50% of your losses caused from product damage. What you're getting is a load that's wrapped correctly, tightly, and safely. Automatic packaging equipment like stretch wrappers improve how your products are protected during shipping. Another cost saving from stretch wrappers is their reduction in 75% of film compared to a manual hand process. That's a huge savings added on to the other benefits. Case sealers can increase your output by 600%. Talk about high production output. These machines can seal cases up to 6 times faster than manual operations. How would you like to have less downtime, shorter production times on a daily basis. That's what you get with case sealers. If you're going through 250 boxes a day, your workers are probably tired, and you can justify the cost of one of these machines. That's an improvement to your bottom-line and an improvement to the moral of the workforce. Another benefit of equipment is the reduction in materials. You can cut your tape usage by up to 30% when you move from hand tape to a case sealer. Let's talk more about end-of-line packaging machines. Creating precise, uniform packages each time they're made helps limit product damage. Your packages will stay together better when they're made right. That's one of the benefits of a case erector. These machines erect cases, (boxes), consistently square every time. They can also work much faster than you or I can. Try 9 times faster! Install case erecting equipment into your operation to increase your output. 500 cases a day, that's all it takes to produce a positive ROI in less than one year with these machines. Looking for something custom? Case erectors can fit into any production line and handle any product sizes, even if you have varying heights. Start your line off right by making the boxes right each time. A major cost saving of equipment for packaging is the labor cost reductions. Case erectors can operate completely with as little as 1-2 operators. One machine will replace multiple packing stations on your operating floor.